Bruce Bigelow likes to have something to do. When he was just a young sprout he used to help his aunt and uncle make maple syrup. He loves maple syrup. He looked around at all the maples in his yard and thought to himself, I am going to tap some trees and make some maple syrup. First he did some research and some planning. He found some books and a video over at the Central Lake Library and studied those. When Bruce makes up his mind things happen. He told me all about it. 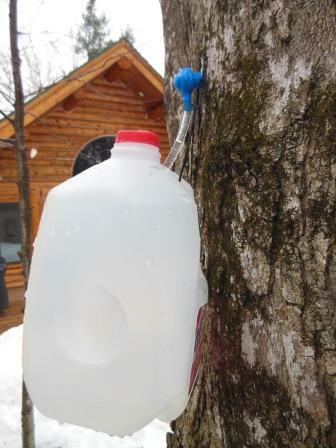 A few days ago, the weather having arrived at favorable conditions for the Rising of the Sap, he tapped ten maples, setting up a tidy collection system of his own devising: recycled milk jugs, handcrafted hooks to hang them from the spiles (those little spouts hammered into the tree). 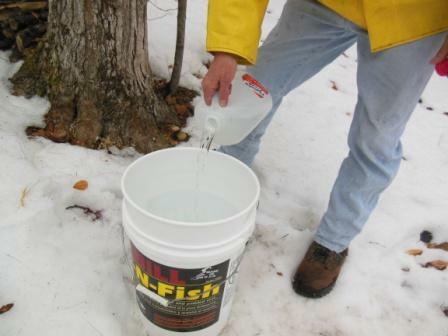 When daytime temperatures rise to springtime and the nights drop below freezing the sap flows. It looks as clear as water. Bruce pours the accumulation of each plastic jug into his Sit-N-Fish tank. Waste not want not. From there we proceed to the ingenious wood-fired evaporation operation next to the woodshed. 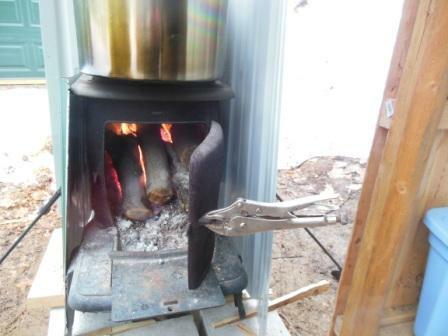 Bruce preheats the cold sap on one of those little gas backpacking stoves that you pump up. That brings it up to a good simmer pretty quickly, but the fuel is expensive. Thus the second step . . . 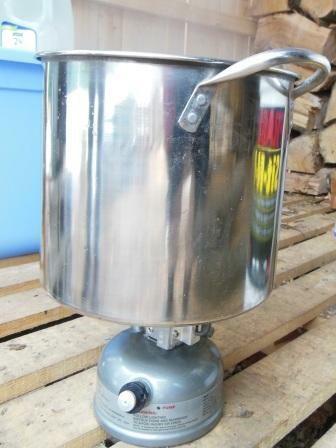 Yes, those would be Karen’s soup pots pressed into service. 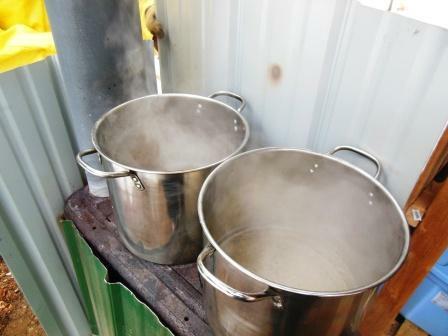 They are perfect for simmering maple sap which, when you think about it, is a lot like making soup. You have to simmer it gently for a long time to bring out the flavor. You have to keep skimming the foam from the surface. 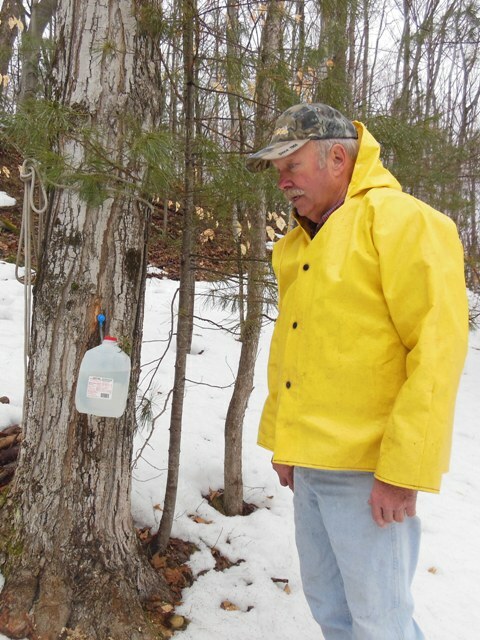 Bruce is just getting started, but he says his trees are yielding 11 gallons of sap each day. 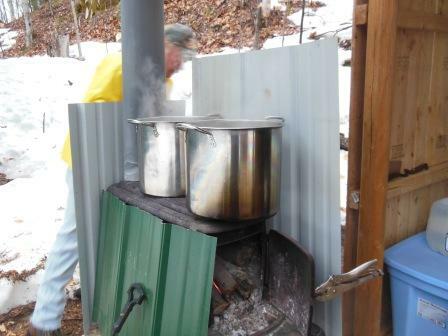 He will have to boil down 33-40 gallons of sap to make one gallon of syrup, so he has his work cut out for him. While we talked we could hear pileated woodpeckers setting up housekeeping nearby. Bruce says he’s seen some large owls, too, and thinks they’ve been hunting for rabbits . . . and for pileated woodpeckers. (He found feathered evidence on his roof.) That’s Mama Nature for you. The sweet sap rises, the predator strikes. It’s enough to occupy a person’s mind. Same reason you skim the foam off a nice pot of chicken soup as it simmers. Gunk rises to the top. I thought that was fat in the chicken soup. And chicken fat isn’t always a bad thing- especially when it’s organic chicken. But I’m thinking the stuff they skim off the boiling syrup is like the froth I see when I boil my bottle of the stuff. Obviously, it’s been “cleaned” before it hits the bottle. Got it. Ah. 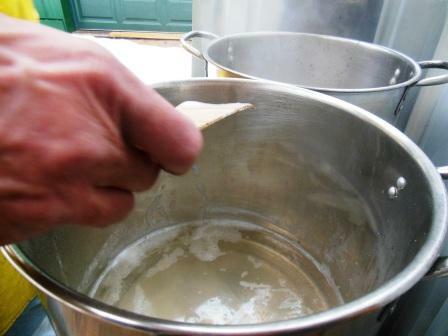 The foamy stuff on chicken soup – often referred to in old recipes as “scum” that the cook is to skim and discard – is not fat per se. It’s just . . . gunk. (If I were Linda I’d go research the subject on Google, but you know how I am.) When all the foamy stuff is removed and the nice broth is chilled, the chicken fat forms a thin layer on top of the gelatinous excellence. Not a bad thing, that chicken fat. Perfect, in fact, for sauteeing chicken livers. I just happen to have a little pot of gold in my cupboard – a 12 ounce bottle of maple syrup from Charlevoix. Actually, I have half a bottle left. I’ve enjoyed one supper with it. Now that you’ve reminded me how good it is, I may have to finish it off this weekend. We’re forecast to have gray and gloomy, so it may be a good time for one more hearty meal. There are fresh strawberries now, too – that would be a nice touch, don’t you think? Strawberries? You’re killing me here. You know what it is doing outside right now? It is snowing. It was snowing on the festive Easter Trees outside the Torch Lake Cafe, where the perch dinner was excellent. It was snowing on my winding road, and on the steps up to my front door, and all over my parade. One might think such activities would be confined to the northern woods. But I recall my older brother tapping a bunch of trees in Patton Park in the Redford area of Detroit. Then there was all night cooking on our stove. I am not sure if I ever tasted the maple syrup from the Patton Park trees. And another Bruce heard from! Hello Weatherman. I’ll bet your weather station is spinning tonight. It would never have crossed my mind to tap trees in Patton Park. Your brother must have been an adventuresome sort. No surprise there. I must ask Rob the Firefighter if he ever tapped city trees. One gallon of that syrup would be worth the time and work! 🙂 I was up there in 2010 at the end of March and saw forests of trees with buckets attached. Was beautiful. Never got brave enough to go up to the strangers in the little shacks with the smoke coming out to see what happened next. Glad to see it here! Maple syrup is liquid gold. I use it very sparingly. Lots of people up here tap their trees and are happy to have a visitor or two drop by. After all, a person enjoys swapping stories in the fragrant steam. Still, you are wise to be cautious about little shacks with smoke coming out. Yes indeed. Allow me to recommend a book: MAPLE SUGAR: FROM SAP TO SYRUP – THE HISTORY, LORE, AND HOW-TO BEHIND THIS SWEET TREAT, by Tim Herd. Illustrations are great, too. You may indeed. Given your particular interest in all things agricultural (not to mention in excellent treats), I will hazard a guess that the book is available at Dog Ears Books in Northport, for those who live Over There! I think Miss Sadie, the Cowboy and I should open a branch bookstore over here. We could call it Dog Tales – or perhaps Dog Ears Too.